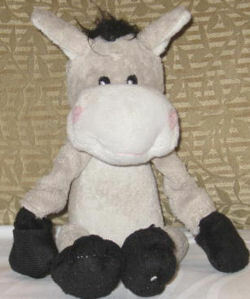 I’m looking for a small gray floppy donkey with a white muzzle,ears, and tummy. He has black hooves, mane, and tail. We are heart broken. We lost him yesterday in Hong Kong. He is our fortune donkey. We had it the day of our wedding, and since then he was always traveling all over the world with us. Soooo sad. He is needed from an emotional point of view, as my wife is devastated.